Like most kids, my allegiances changed pretty rapidly. That affected my movie preferences. One day Star Wars was my ultimate film, but then I changed my mind and adored Jaws 2 even more. One of my first-ever “R”-rated flicks – 1979’s Alien - briefly held my top spot, and other adult-oriented fare followed. Between Alien and Kubrick’s The Shining, I came to love a very improbable flick: 1979’s Bob Fosse semi-autobiography, All That Jazz. Maybe I was just a weird 12-year-old, for Jazz certainly isn’t the kind of fare typically embraced by those in that age bracket. This was so long ago that I honestly can’t recall why I felt so passionately about Jazz. I also can’t remember the last time I saw the movie prior to its DVD release in 2003. I vaguely recall a mid-Eighties screening on cable, but that’s about it. The film focuses on the life of noted Broadway choreographer and film director Joe Gideon (Roy Scheider). 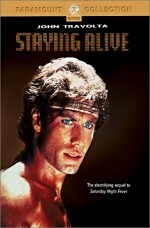 The movie lacks much of a plot as it examines Gideon’s day-to-day routine as it leads him toward disaster. An alcoholic, chronic smoker, pill-popper and womanizer, Gideon burns the candle at both ends. He works on the editing of his nearly finished film The Stand-Up while he directs a new stage production. He also maintains a girlfriend named Katie (Ann Reinking) while he nails dancers from his show. Joe’s ex-wife Audrey (Leland Palmer) stars in the latter. Their working relationship seems decent, but tension exists between them, largely due to Joe’s semi-neglect of their daughter Michelle (Erzsebet Foldi). Due to problems with both the movie and the show, Gideon is under a lot of pressure, which steps up his personal misery. Eventually Gideon becomes ill and gets hospitalized with chest pains. From there the movie sees what happens to the character in his debilitated state. Unconventionally made, All That Jazz comes across as much less of a “TV movie” biopic than the way I describe it. A lot of that stems from Fosse’s construction of the story. He intercuts past, present and future on occasion, and also goes into apparent fantasy. The latter stems from the character of “Angelique” (Jessica Lange). A literal angel of death, Gideon chats with her occasionally throughout the movie, and this allows us to get some insights into Gideon’s character and development. We see glimpses into why he behaves the way he does, but to the director’s credit, he never tries to use the past to excuse his foibles. Introspective but not self-pitying, these moments help flesh out the film. They also blend quite well with the rest of the picture and give us a good look at Gideon’s mindset. He views virtually everything from a superficial show biz point of view; even the presentation of medical issues from the doctors becomes a production number. Fosse stages many of these moments tremendously well. For example, he drops out the sound to accentuate Gideon’s point of view during his initial chest pains, and the melding of argument with creativity during an conflict with Audrey also seems terrific. Although billed as something of a musical, don’t expect tremendous amounts of visual pizzazz from Jazz. To be sure, the smattering of production numbers deliver lots of flair, but they aren’t the point of the film. Instead, Fosse wants to get inside the lead character’s mind, which really means he’s willing to explore his own psyche. Jazz seems remarkably open and honest as Fosse presents himself at his worst. We get a feeling why Gideon became such a success, but he doesn’t get a sweetened presentation. Scheider’s layered performance helps make the film work. He clearly avoids self-pity and sentiment. Restrained and compelling, Scheider takes on the emotional roller coaster experienced by Fosse as he turns Gideon into a charismatic but flawed character. At times All That Jazz seems too long, and Fosse also comes across as somewhat too cynical at times. The movie periodically feels like an attempt to attack show business, especially when we see the coldness of so many people involved in the Broadway production. Still, it gives us a frank and effective portrayal of a self-destructive man. I’m not terribly sure why I loved the flick so much as a kid, but it holds up well after 35 years and reveals quite a few charms. 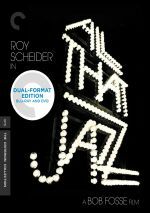 All That Jazz appears in an aspect ratio of approximately 1.85:1 on this Blu-ray Disc. This was a good representation of the source. Sharpness mostly looked fine. Some shots came across as a bit soft and ill defined, but those instances didn’t occur with any great frequency, and they occasionally seemed to reflect the original photography, as the movie sometimes opted for a gauzy look. While not the world’s most precise image, it appeared positive. I saw no issues related to jagged edges or moiré effects, and edge haloes remained absent. With a good layer of grain, I sensed no digital noise reduction, and the movie came free from print flaws. From start to finish, this remained a clean presentation. Jazz featured a fairly natural palette, and most of the tones came across as accurate. While I couldn’t say the hues impressed – and some red lighting looked a bit heavy – the colors seemed largely accurate. Black levels were deep and dark, and low-light sequences followed along the same lines. Shadow detail seemed smooth and demonstrated good clarity within the restrictions of the source photography. Overall, the image showed some age-related drawbacks but it came across well. The DTS-HD MA 3.0 soundtrack of All That Jazz seemed mostly limited in scope, as the majority of the movie essentially offered monaural audio. Dialogue and effects always seemed rooted in the center channel. Music also often stayed focused in the middle speaker, but those elements broadened on occasion. For instance, the production numbers made good use of the side speakers for the tunes. Nonetheless, without the occasional stereo song, the track seemed monaural. Audio quality appeared acceptable for the era. Speech was a little thin but always sounded clear and easily intelligible, and I noticed no problems with brittleness or other issues. Effects played a small role in the movie, but they seemed reasonably accurate and clean. I heard no concerns connected to distortion from those elements. Music varied but generally was fairly bright and rich. The stereo production numbers showed moderately natural highs and some decent bass response. Nothing about the sound of All That Jazz stood out from the pack, and due to its modest scope, I felt it deserved a “C+”. How does this Blu-ray compare with the original DVD from 2003? Audio showed a little more pep – but not a lot, as the scope and quality of the original restricted improvements. On the other hand, the image demonstrated obvious growth. The Blu-ray was cleaner, tighter and more natural than the DVD. It became a good step up in visual quality over the DVD. The Criterion Blu-ray comes packed full of extras, and we begin with an audio commentary from editor Alan Heim. He provides a running, screen-specific look at editing, of course, but Heim also discusses working with Bob Fosse, cast and performances, visual areas and related topics. While Heim gives us occasional insights, this ends up as a frustrating commentary. The track comes with a lot of dead air and doesn’t deliver a particularly strong view of the production. Criterion “borrowed” this chat from a prior DVD and it shows; the label usually produces good commentaries but this one ends up as spotty and inconsistent. Also found on the original DVD, we get a selected-scene commentary from actor Roy Scheider. Recorded in 2001, his remarks come split into five chapters and run a total of 34 minutes, 40 seconds. The actor covers a mix of topics related to the movie such as working with Fosse and his co-stars, the challenges of the role, and differentiating fact from fiction. A few too many of the segments just tell us about how great the others were, but Scheider gets into some good details. It’s interesting to hear his reflections on Fosse, and his story about how he got the role also seems compelling. Plenty of video features follow. First comes an Interview with Actors Ann Reinking and Erzsebet Foldi. During their 33-minute, 59-second chat, they discuss experiences with Bob Fosse and how they came onto the film, aspects of shooting the movie, and reflections on relationships and careers. It’s fun to see the ladies reunited but this doesn’t become the most informative conversation; it gives us decent notes but never really excels. We hear more from the editor during a 15-minute, 19-second Interview with Alan Heim. He covers thoughts about working with Fosse and aspects of editing with him. Inevitably, some of this repeats from the commentary, but Heim still gives us a good chat, and it’s a lot less frustrating than the earlier chat. From January 1980, we see a Tomorrow Episode with Bob Fosse and Agnes de Mille. This piece lasts 31 minutes, 51 seconds as Tom Snyder chats with the film choreographers about various aspects of their work and careers. The presence of two legends together makes this a delightful piece. We learn more about Fosse during an Interview with Biographer Sam Wasson. During this 20-minute, 43-second featurette, Wasson talks about Fosse’s life and career as well as how Jazz reflected reality. Wasson covers Fosse in a tight, satisfying manner. A March 1981 episode of South Bank Show runs 27 minutes, one second and provides an interview with Bob Fosse. Here he discusses aspects of his career. This becomes another engaging chat with Fosse. Another archival piece arrives with a 1986 Gene Shalit Interview with Bob Fosse. Recorded a year before Fosse’s death, it fills 26 minutes, 14 seconds with notes about aspects of his work. Rather than go for the general career overview, Fosse gets into nuances such as his health, casting dancers and different elements of choreography. The program gives us useful notes. Under On the Set, we get two clips. This area shows “Fosse Directing” (7:58) and “Scheider Interview” (3:54). “Directing” gives us glimpses of the “cattle call” shoot, while “Scheider” delivers the actors thoughts about Fosse, the physical demands of the role, and some thoughts about his character. Of the two, “Directing” seems more interesting, as “Scheider” remains too brief and superficial to offer much merit. We take another look at Fosse’s work in the 2007 documentary Portrait of a Choreographer. 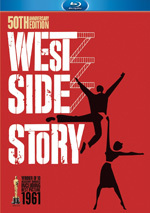 It goes for 22 minutes, 45 seconds and offers info from Heim, actor/singer Liza Minnelli, directors Adam Shankman and Rob Marshall, actor/dancer Sandahl Bergman, and choreographers Anne Fletcher, John DeLuca, Fatima Robinson, Kenny Ortega. The show looks at aspects of Fosse’s work, with an emphasis on All That Jazz. A few decent nuggets emerge, but the piece usually does little more than praise Fosse and the film, so it gets tedious. Two more featurettes appear. The Soundtrack: Perverting the Standards runs seven minutes, 50 seconds and gives us info from Heim, Minnelli, DeLuca, Marshall, and composers Glen Ballard, Jerry Casale, Mark Mothersbaugh and Diane Warren. As expected, they talk about the music used in the film. Like “Portrait”, it tends to be superficial, but it seems a bit stronger, perhaps because it fills less time. Finally, The Making of the Song ‘On Broadway’ goes for three minutes, 36 seconds and shows singer/songwriter George Benson. He discusses the original song and his recording of it. Though brief, Benson offers a few nice notes about his work. In addition to the film’s trailer, we find a booklet. This piece includes an essay about Fosse from New Yorker writer Hilton Als as well as photos, credits, and chapter listings. It’s another good complement to the package. The package also provides a DVD copy of All That Jazz. It presents the same extras as the Blu-ray. While the movie didn’t move me as much as it did 30-plus-years-ago, I still found All That Jazz to present a lively and provocative affair. Director Bob Fosse crafted a clever and intriguing semi-autobiography that earned points for daring and bluntness. 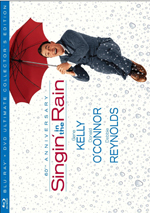 The Blu-ray brings us generally good picture and audio as well as a broad roster of bonus features. This becomes the definitive home video version of the film.